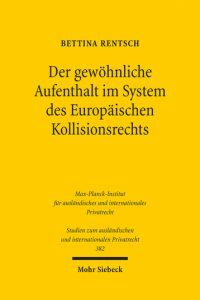 Bettina Rentsch, Humboldt-University Berlin, has authored book about the concept of “habitual residence” in European private international law (Der gewöhnliche Aufenthalt im System des Europäischen Kollisionsrechts, ISBN 978-3-16-155172-7). Published by Mohr Siebeck, she sheds light on the concept as such and re-frames the ongoing academic debate with a focus on the relationship between habitual residence and party autonomy. 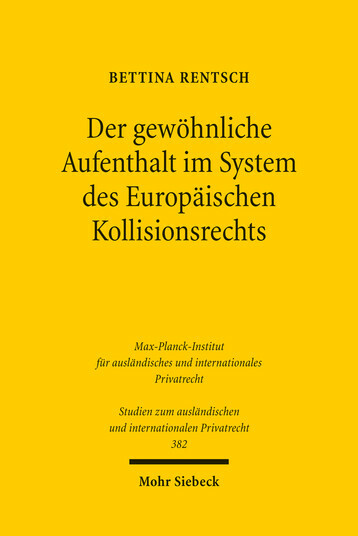 European PIL has become increasingly heterogeneous in its legal foundations, shape and principles. Still, all so-called “Rome” regulations are homogeneous if not even uniform in their connecting factors: In the absence of Choice, the law applicable will determined by virtue of Habitual Residence. As a general baseline, the pairing of Party Autonomy and Habitual Residence is a common feature of all Rome regulations. While the recent rise of the former anhas given rise to widespread academic discussion, little has been said on why the EU legislator ever came to choose Habitual Residence as its primary “objective” connecting factor. Neither is there clarity on the political backgrounds nor on the secondary question of whether the former is identical in all contexts Habitual Residence is employed in. In light of the increase of transnational migration in the EU, the present conceptual vagueness of Habitual Residence cannot be tolerated. In fact, there is both a need for reliable proxies in determining Habitual Residence and an urge to assess whether it can and must be understood and applied different in respective areas of EU Private International Law. First, the threshold criteria for Habitual Residence are identical no matter its “purpose” and systematic environment. As a result, drawing the line between different instances of Habitual Residence is a question of degree. Second, Habitual Residence must be interpreted in light of its respective neighboring choice of law-provisions. In other words, the the extent of choice of law possibilities must be understood as a proxy for interpreting Habitual Residence. Hence, the more leeway the European legislator confers to individuals and the more self-regulation through party autonomy he allows for, the less control by authorities can be required. In practical terms, the mere presence and superficial social interaction of a human being can be sufficient to determine Habitual Residence in contractual relations, the visible limitations of choice in areas like successions law indicate legislative intent.